Science is one of the easiest and most enjoyable subjects to learn without a curriculum. Science experiments are also surprisingly easy to strew. What kid – big or small – can resist the temptation to find out what will happen when we add this liquid to that powder, or when we connect a battery to this strange contraption? 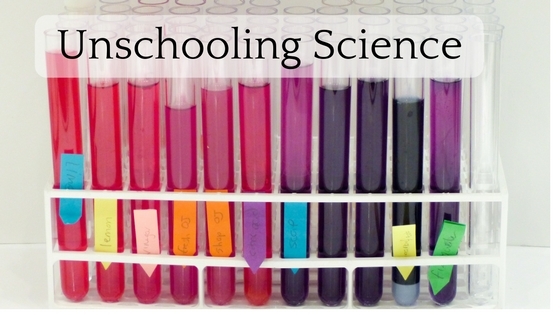 What’s in my unschooling science video? In my video this week I talk about – and show you – a fun afternoon we spent experimenting. As you’ll see, my children each took the initial idea to make red cabbage indicator in a completely different direction. And you’ll hear about the shocking discovery I made when I recently browsed a science curriculum for KS3 children (aged 11-14). My son would (approvingly) call the previous sentence ‘click bait’. Sorry about that. I first wrote ‘surprising discovery’ but I went back and changed it because my jaw really did drop at what I saw! (2) Cordie’s liver and hydrogen peroxide experiment that I talk about in this video. You might also like to look at my science page for other fun experiments we’ve done. If you enjoy watching the video I’d love you to share it on Facebook. You can also subscribe to my YouTube channel and like my Navigating By Joy Facebook page. I’m appreciatively linking up at Weird Unsocialized Homeschoolers Weekly Wrap-Up. Wow! That was super. You were both so great in front of the camera. I look forward to meeting Cordie on video too. We also did that experiment a few years ago. We just might need to revisit it. I’d love love love to see the video about how you and the kids choose what to learn. Surely there’ll be no Judgy McJudgersons here. Homeschooling has SO many different styles, and unschooling has its whole own range of flavours too. Honestly, I can’t tell you how much I appreciate your encouragement, M. Your daughter is so lucky to have you supporting her learning. Btw I absolutely loved reading about your day. Thank you for sharing it, it was fascinating and inspiring. More on that via email. Thank you for watching the videos and for your encouragement! That was a great video! I can see why you were shocked by your discovery. Did you contact the curriculum provider and tell them there’d used your photo without permission? Surely they used it illegally? I once found one of my images on someone else’s blog. Because it wasn’t a photo of my kids and it was on a homeschool blog, I overlooked the fact they hadn’t asked if they could use it. It just makes me wonder, though, how many of our photos are stolen without our knowledge. I really should watermark mine. Anyway, I enjoyed watching your video and look forward to the next one! Thank you so much, Sue. I really enjoyed making it. I can’t believe they used your photos/ideas without your permission (so illegal! ), and are also selling their curriculum for 300 pounds! Wow, I would definitely contact them. Yeah I really must contact them. I’m sure they didn’t intend any harm, but I don’t think I’m unreasonable wanting at least some recognition! Possibly they didn’t mean any harm, but…to use someone else’s content/pictures without their permission and then to turn around and charge that much for it? Yikes! I had a very nice apology from the curriculum makers. They’ve linked to my blog and given me a free set of their whole KS3 (middle school) science curricula. 🙂 Thanks for prodding me to take action! Love the video experiments. They can watch those and recall the experience. Thank you for watching, Nita. Yes videos are a really fun way of revising!